· one golfer FREE in eight! 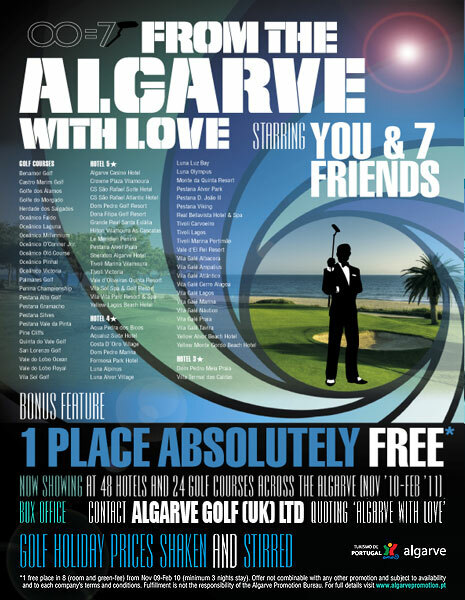 We inform you that the above hotels and golf courses listed left and featuring the ' ' icon have joined the campaign "From The Algarve with Love", an initiative of the Algarve Tourism Board for the golf market. Therefore, we are very pleased to announce that in each group of eight players, one is free (accommodation and/or green fees). We are also pleased to confirm that the 7 Oceanico golf courses of Laguna, Pinhal, Millennium, Old course, Victoria, Faldo & O'Connor are to offer 1 free in every 8 from now until October 31, 2011. This offer is valid at the above hotels and golf courses. This offer is valid over the contract rate, on a bed and breakfast basis, and it is cumulative with the Monthly Offer (if there is one valid when making the reservation). This offer is valid for stays in November and December 2010 plus January and February 2011 (subject to availability). This offer is exclusive for the following markets: Scandinavia, Finland, United Kingdom, Ireland, Germany and Holland. This offer requires a minimum stay of 3 nights. This offer is not cumulative with any other offers mentioned on our website.